An infinitely adjustable mount that's highly user-friendly and guaranteed to provide a professional, clean finish to any desktop, point of sale or touch screen application. The POS Multi Height Adjustable creates an individualized display, allowing you to easily mount and adjust screens weighing up to 44lbs. 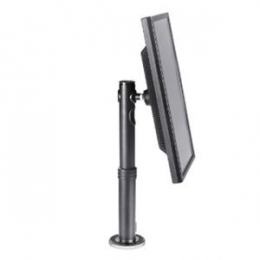 Using the telescopic pole and built in handgrip the display can be adjusted between 13" and 17.91" in height. The ball joint mechanism allows 20 degrees of display adjustment in any direction from the vertical plane. The angle of the display and rotation of the pole can also be locked off to allow for touch screen applications. Internal cable management and the ability to feed cables either through the work surface or the mount's optional cable access ports ensure a professional installation, with enhanced theft resistance thanks to concealed mounting hardware and a security screw mechanism.